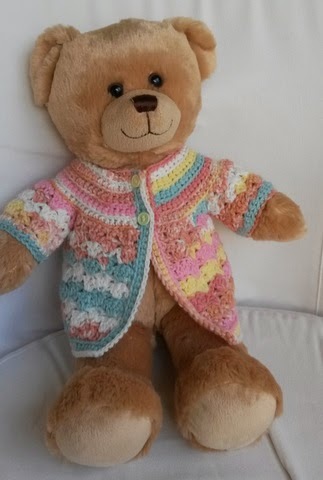 My crochet teddy dress pattern has been very popular so I thought I'd have a go at a crochet jacket. The sleeves are made first then the main body is made in one piece to armholes. 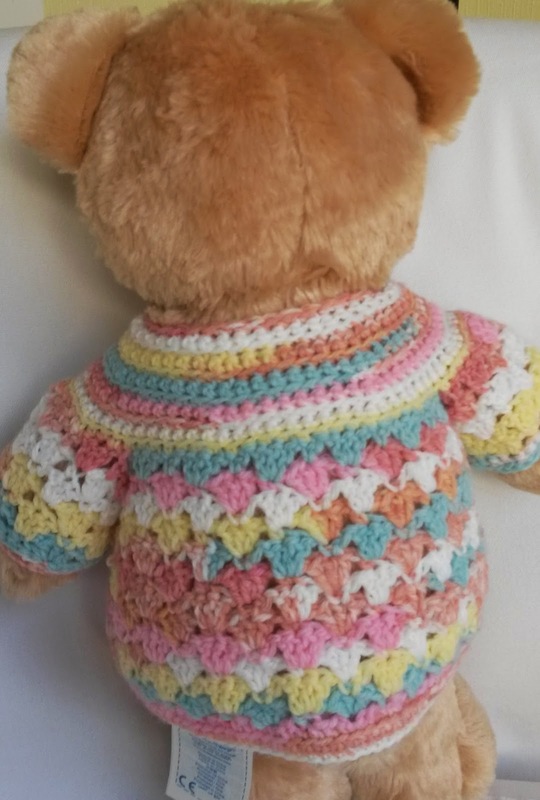 The yoke is crocheted across the right front, sleeve, back, sleeve then left front and continued in rows. I work the dc through the font loops only to made a softer fabric. 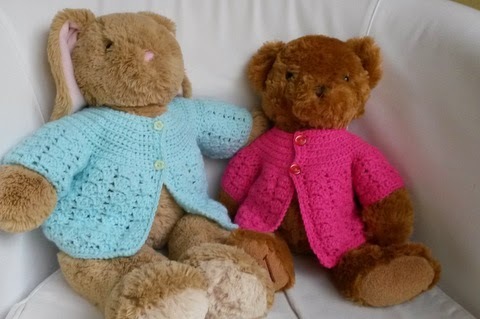 All teddy bears are different sizes - my models are a 14" bear i picked up in a charity shop and build a bears lil cub is 15" and the bunny is 17". 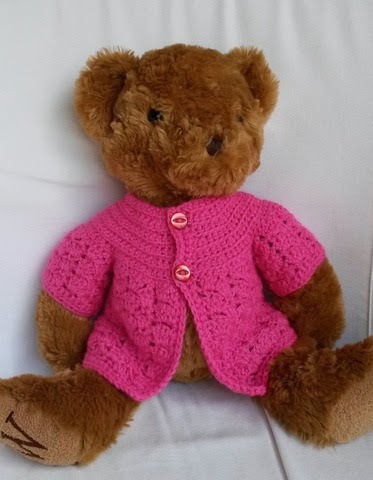 The pattern is easy to alter to fit your bear - just increase the rows on the sleeves or body. You could also add an extra decrease row at the neck edge if you want. I've had a few problems writing this pattern in both sizes so if you find any mistake or typos please leave a message so I can amend it. Any Ravelers out there - I would love to see a photo of your project linked to this pattern. row 1: 2ch, (3tr in next dc, 1ch, miss 1tr, 1dc in next tr, 1ch) rep to last dc, 3tr in dc, 1ch, 1dc in top of 4ch space. The yoke is worked in dc rows, make 1ch at beg of each row as edge st - does not count in stitch count and work in front loop only for a softer fabric. Miss dc and next 3trs on sleeve, (1dc in next dc, 1 dc in each of next 3trs) 4 times, 1dc in next dc. Miss dc and next 3trs on sleeve, , (1dc in next dc, 1 dc in each of next 3trs) 5 times, 1dc in next dc. Miss dc and next 3trs, (1dc in next dc, 1 dc in each of next 3trs) 4 times, 1dc in next dc. Work 2 rows of dc down left front, along hem and up right front, working a 2ch buttonhole at beg of yoke and at neck edge on first row.